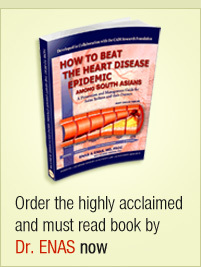 As has been repeatedly demonstrated in a variety of prospective epidemiologic studies over the past several decades, CAD (coronary heart disease) is a multi-factorial disease whose roots begin at an early age. Elevated blood lipids are a fundamental feature of CAD, especially in persons with early onset of the disease. The vast majority of prospective epidemiologic investigations over the past four to five decades have shown that increasing levels of various serum lipids, most notably total and LDL-cholesterol levels in children are associated with an increased risk for CAD in middle-aged and beyond. 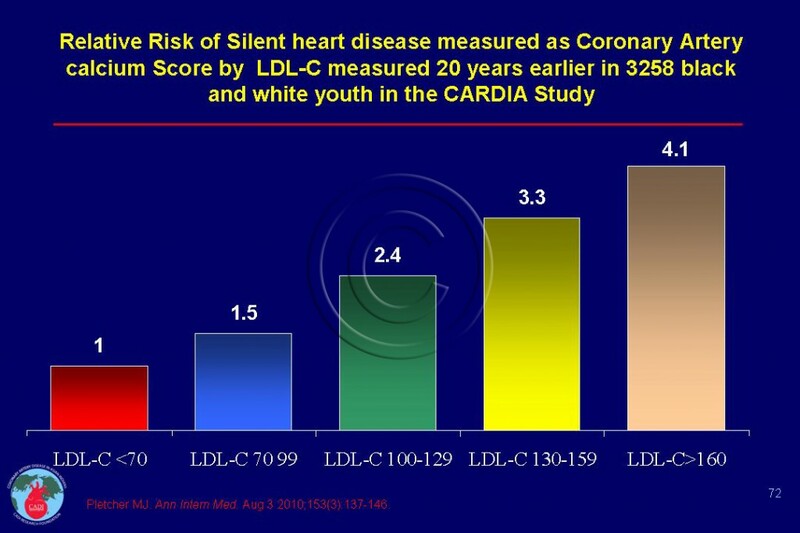 Nonoptimal levels of LDL and HDL cholesterol during young adulthood (age 18-30 years) are independently associated with coronary atherosclerosis two decades later (average age 45) as evidenced by a high coronary artery calcium score in the carefully conducted CARDIA study (Figure 072).2 The findings are consistent with the results of earlier epidemiologic studies in pediatric populations. Given the presence of coronary calcification in the middle-aged years may be related to the development of heart attack later in life, it remains prudent for individuals with less than optimal serum lipids to modify their subsequent risk of CAD. It is also well known that abnormal lipid levels in young adults are associated with other important coronary risk factors, including diabetes and obesity, and further emphasize the need for preventive measures against CAD at a young age. These tried and proven methods include attention to dietary fat and total caloric intake, maintenance of optimal weight and waist girth, and engagement in regular exercise throughout all stages of life. It is never too early to engage in heart healthy lifestyle and eating practices to both prevent, and/or delay to the latter years of life, the development of CAD. When to Screen Children for Cholesterol? Besides, about 10% of children without such family history may have high cholesterol requiring dietary modification and 2% may have high enough LDL-C requiring medication (LDL-C >160 mg/dl) according to a study involving more than 20,000 fifth grade school children.4 These children may be identified by screening for abdominal obesity or high blood pressure. Cholesterol can be tested at age 2 years and those found to have high levels should be managed with aggressive modification of lifestyle with special focus on reduced intake of saturated fat and trans fat (until eight years of age when pharmacological therapy should be initiated if the LDL-C goals are not met). Statins have been shown to be effective in reducing LDL-C, restoring endothelial dysfunction and flow-mediated dilation, as well as slowing carotid intima-media thickening (silent heart disease) in children. Several statins are approved for use in children. 1. Goldberg AC, Hopkins PN, Toth PP, et al. Familial hypercholesterolemia: screening, diagnosis and management of pediatric and adult patients: clinical guidance from the National Lipid Association Expert Panel on Familial Hypercholesterolemia. J Clin Lipidol. Jun 2011;5(3 Suppl):S1-8. 2. Pletcher MJ, Bibbins-Domingo K, Liu K, et al. Nonoptimal lipids commonly present in young adults and coronary calcium later in life: the CARDIA (Coronary Artery Risk Development in Young Adults) study. Ann Intern Med. Aug 3 2010;153(3):137-146. 3. Freedman DS, Wang YC, Dietz WH, Xu JH, Srinivasan SR, Berenson GS. Changes and variability in high levels of low-density lipoprotein cholesterol among children. Pediatrics. Aug 2010;126(2):266-273. 4. RitchieSK, Murphy EC, Ice C, et al. Universal versus targeted blood cholesterol screening among youth: The CARDIAC project. Pediatrics. Aug 2010;126(2):260-265. 5. Avis HJ, Hutten BA, Gagne C, et al. Efficacy and safety of rosuvastatin therapy for children with familial hypercholesterolemia. J Am Coll Cardiol. Mar 16 2010;55(11):1121-1126.